"...Muslims in India, in terms of their social structure, consist of three groups—ashrafs, ajlafs and arzals. The three groups require different types of affirmative action. The second group, ajlafs/OBCs, need additional attention which could be similar to that of Hindu-OBCs. The third group, those with similar traditional occupation as that of the SCs, may be designated as Most Backward Classes (MBCs) as they need multifarious measures, including reservation, as they are ‘cumulatively oppressed’...."
This chapter looks into various policies of affirmative action available for the Muslims or a segment of them and the impact of these policies on their living conditions. Since the implementation of the Mandal Commission Report for Central Government services, Other Backward Classes (OBCs) among Muslims have been identified and, along with backward groups from other religions, the benefit of OBC reservation has been extended to them. The present attempt is to compare the socio-economic status of Muslims who are not listed as OBCs (named Muslim-General) and do not avail reservation of any kind with those who are OBCs. The status of both these social groups is also compared with those of Hindu OBCs, who form bulk of the OBC population in the country. The attempt is to comprehend the extent of respective relative deprivation. This comparison is now facilitated by the NSSO that from its 55th Round onwards has begun collecting data on Muslims which can be disaggregated along Socio-religious Communities (SRCs). At the outset, it must be noted that the NSSO data is selfreporting and, particularly so in the case of OBCs, it is contingent on the awareness of the respondent of his/her social status. The primary intent of this chapter is to look at Muslim-OBCs from the perspective of affirmative action. Therefore, the most pertinent categories are Hindu-OBCs and Muslim-OBCs. However, in order to understand the intra-community variations, it is necessary to provide comparative data regarding the rest of the Muslims (referred to as Muslim-Gen from now onwards). This chapter draws from a wide array of data, both secondary and primary. Sociological studies on Muslim social stratification have been drawn upon to comprehend the complexity of castes or biradaris among Muslims in India. Studies on backward class movements, analysis of Constituent Assembly Debates and the various landmark judgments of the Supreme Court and the High Courts have been of great help in understanding the historicity of the emergence of the category ‘Other Backward Classes’. In the wake of the absence of caste enumeration after Independence, much of the empirical data on Muslim OBCs—their share in population, in education and in public employment, have been drawn from the 61st Round of National Sample Survey (NSS) that includes OBC among Muslims as a category of analysis. For the sake of comparison, data from 55th Round is also used. More importantly, the data on education and public employment that has been made available exclusively to this Committee by various departments and ministries of the central and state governments, universities and institutions and Public Sector Undertakings (PSUs) have been studied and analysed for the purposes of comprehending the relative share of Muslim OBCs. In order to understand whether all the backward groups among Muslims have been included in the state and the central lists of OBCs, we have depended largely on the state and central lists and tried to identify the lack of correspondence between them. Further, the list provided by the Mandal Commission has also been consulted. The massive exercise undertaken by the Anthropological Survey of India, under its People of India Project, to profile social groups in India has been utilized to cull out the various Muslim castes/biradaris found in different regions and provinces of the country. The rest of the chapter deals with the following areas. Sectioin 2 looks at the emergence of the category, OBCs, in the official discourse and the debates surrounding it. The next section draws the social profile of Muslim OBCs. This is followed by an analysis of various attempts, both at the Centre as well as at the state levels, at affirmative action targeting them. The subsequent section is an attempt at comparing the central and various state lists of OBCs so as to identify the lack of correspondence between them. The last section studies the empirical situation and compares the relative status of Muslim-OBCs with that of the OBCs among Hindus and also Muslim-Gen. The Constitutional reference to the term ‘backward classes’ finds place in articles 15(4) and 16(4) wherein the State is empowered to make special provision for any socially and educationally backward classes (SEBCs) of citizens. Yet unlike the categories of Scheduled Castes (SCs) and Scheduled Tribes (STs) that were distinctly defined, the category ‘backward classes’ remained ambiguous. The term had come into usage during the British period but with a variety of referents and evidently without any clearly specified parameters regarding the inclusion and exclusion of groups clubbed as backwards. In its early usage, the ‘backward classes’ was an all-encompassing category that would include the underprivileged and the marginalized castes, tribes and communities. The term was used as far back as 1880 to describe a set of groups, also called illiterate or indigent classes, entitled to allowances for study in elementary schools. Article 340 empowers the State to appoint a commission ‘to investigate the condition of socially and educationally Backward Classes’. At the all India level two such commissions have so far been appointed-Kaka Kalelkar Commmission and B.P Mandal Commission. The First Backward Classes Commission (Kaka Kalelkar Commission) submitted its report in 1955. The Commission emphasized the lower status in the caste hierarchy as the determining factor for backwardness along with other considerations such as educational levels, income levels and representation in public employment. The Commission’s Report was the first instance in which certain castes/communities among Muslims (and other religious minorities) were also declared backward and brought within the purview of affirmative action. The Second Backward Classes Commission (B.P Mandal Commission, 1980) too relied on the caste criterion, however, the tangible indicators to ascertain a caste or any social group as ‘backward’ included lower position in the caste hierarchy, lower age at marriage within the group, higher female work participation, higher school drop out rate, inaccessibility to drinking water, lower average value of family assets, higher occurrence of Kutcha houses and so on. In the case of non-Hindu communities, different yardstick was employed which is discussed later in this chapter. The usage of ‘classes’ instead of ‘caste’ in Constitutional reference to OBCs viz. article 15 (4), 16(4) and 340 (1) has led to many legal wrangles and disputes. However, the courts, like the two Backward Classes Commissions accepted ‘caste’ as a basis of classification. In Venkataramana Vs State of Madras, the Supreme Court upheld the list of Hindu castes declared as backward by the Madras government. This was further confirmed in Ramakrishna Singh Vs. State of Mysore in which the Mysore High Court held that class included persons grouped on the basis of their castes. A series of Supreme Court cases have further refined the provision. In Balaji v. the State of Mysore, the Supreme Court put a ceiling on the total quota for affirmative action at fifty %. It was critical of using the caste criterion, and one of the reasons cited was its inapplicability to non-Hindu groups. In Chitralekha v State of Mysore the Court clarified that the (i) ‘caste...may be relevant...in ascertaining..social backwardness’; but (ii)’it cannot be the sole or dominant test’. The ‘caste basis’ was further clarified in 1968 in P. Rajendran vs. State of Madras, wherein the Supreme Court held that ‘a caste is also a class of citizens if the caste as a whole is socially and educationally backward’. This was reaffirmed in U.S.V. Balaram Vs. State of Andhra Pradesh when the Supreme Court scrapped the Andhra Pradesh High Court ruling and allowed the use of caste as a determinant to define backwardness. In the celebrated Indira Sawhney vs. the Union of India (Mandal case), the 9 judge bench rejected economic criterion as the determinant of backwardness. The Court upheld the concept of caste: ‘A caste can be and quite often is a social class in India’. On the question of backward classes among non-Hindus, the Court held that they should be identified on the basis of their traditional occupations. Thus, from an all encompassing category as during the British period, backward classes as a category has gradually emerged to specifically refer to those caste groups that occupy the middle position in the social hierarchy and lag behind in terms of economic, educational and other human development indicators. Sociological studies on the social structure of Muslims in India have emphasized on the presence of descent based social stratification among them. Features of the Hindu caste system, such as hierarchical ordering of social groups, endogamy and hereditary occupation have been found to be amply present among the Indian Muslims as well. The Census of India, 1901 listed 133 social groups wholly or partially Muslim. The present day Muslim Society in India is divided into four major groups: (i) the Ashrafs who trace their origins to foreign lands such as Arabia, Persia, Turkistan or Afghanistan, (ii) the upper caste Hindus who converted to Islam, (iii) the middle caste converts whose occupations are ritually clean, (iv) the converts from the erstwhile untouchable castes, Bhangi (scavenger), Mehtar (sweeper), Chamar (tanner), Dom and so on. Muslim groups currently bracketed under the category ‘OBC’ come essentially from the non-ashraf section of the Muslim population. They are the converts from the middle and lower caste Hindus and are identified with their traditional occupation. A study of a village in Uttar Pradesh could identify eighteen such groups, for example, Julahas (weavers), Mirasis (singers), Darzis (tailors), Halwais (sweetmakers), manihars (banglemakers) and so on. The 1911 Census listed some 102 caste groups among Muslims in Uttar pradesh, at least 97 of them came from the non-ashraf category. Many such groups such as the Rajputs, Kayasthas, Koeris, Koris, Kumhars, Kurmis, Malis, Mochis were common among both Hindus and Muslims. Since the Constitutional (Scheduled Caste) Order, 1950, popularly known as the Presidential Order (1950), restricts the SC status only to Hindu groups having ‘unclean’ occupations, their non-Hindu equivalents have been bracketed with the middle caste converts and declared OBC. Thus, the OBCs among Muslims constitute two broad categories. 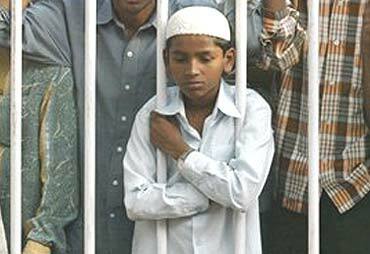 The halalkhors, helas, lalbegis or bhangis (scavengers), dhobis (washermen), nais or hajjams (barbers), chiks (butchers), faqirs (beggars) etc belonging to the ‘Arzals’ are the ‘untouchable converts’ to Islam that have found their way in the OBC list. The momins or julahas (weavers), darzi or idiris (tailors), rayeens or kunjaras (vegetable sellers) are Ajlafs or converts from ‘clean’ occupational castes. Thus, one can discern three groups among Muslims: (1) those without any social disabilities, the ashrafs; (2) those equivalent to Hindu OBCs, the ajlafs, and (3) those equivalent to Hindu SCs, the arzals. Those who are referred to as Muslim OBCs combine (2) and (3). At the all India level, the issue of OBCs has been attempted to be addressed by instituting two backward classes commissions with the mandate to evolve the criteria of backwardness, identify social groups on that basis and suggest measures to ameliorate their condition. Of the two, the report of the first commission (Kaka Kalelkar Commission) was rejected by the Union government for having used ‘caste’ and not the economic criterion for identifying backward classes. The report of the second commission (Mandal Commission) was partially implemented in 1991 more than a decade after it was submitted. Beside these two attempts at the Centre, various state governments instituted their own backward classes commissions and have evolved distinct approaches to reservation of backward classes. A national level consultation on Muslim OBCs was organized by this Committee to take stock of the divergent issues plaguing this section of Muslims in India. The two-day Conference drew participants from different regions and provinces of the country. It included activists from the Muslim OBC groups, scholars who had studied and reflected on the problem and representatives from religious bodies. There was a consensus among the participants that Muslims were a differentiated group and this should be reflected in all policy initiatives of the government. Activists made a strong case for the inclusion of Muslim groups with similar occupation as that of Hindu SCs in the SC list. The question of discrimination in according ST status was also raised. It was reported that in Uttar Pradesh, the Hindu Banjaras were in ST list while their Muslim counterparts were listed only in the OBC list. The gross under-representation of Muslims in public and also in private sector employment was seen as a matter of concern. The representation of Muslim OBC was even worse. Therefore, there was a need for a separate quota for them within the OBC quota, it was suggested. While upholding the reservation for Muslim OBCs, one view was that the condition of those currently not covered by the reservation scheme was also pathetic and calls for immediate remedies. Women participants complained how the benefits of reservation were always usurped by the male members of the community. However, majority of Muslim women were self-employed and hence required different measures, it was pointed out. Scholarships, free uniforms and construction of hostels for children of backward Muslims was demanded. In the wake of the onslaught of globalisation, it was held that the emerging situation calls for the upgradation of technology and re-skilling of the technicians. The activists complained about the bureaucratic hurdles in getting caste certificates. They also demanded implementation of the Mandal Commission recommendations in centrally governed institutions of higher learning. a. All ‘untouchables’ converted to any non-Hindu religion. In the Muslim case, they are the arzals. b. Such occupational communities which are known by their name of their traditional hereditary occupation and whose Hindu counterparts have been included in the list of Hindu OBCs. Among Muslims, this comprises the ajlaf category. By clubbing the arzals and the ajlafs among Muslims in an all encompassing OBC category, the Mandal Commission overlooked the disparity in the nature of deprivations that they faced. Being at the bottom of the social hierarchy, the arzals are the worst off and need to be handled separately. It would be most appropriate if they were absorbed in the SC list, or at least in a separate category, Most Backward Classes (MBCs) carved out of the OBCs. In terms of their policy of reservation for backward classes, Kerala and Karnataka stand out for having extended the benefits of reservation to their entire Muslim population. This has been achieved by including Muslims (minus the creamy layer) as a distinct group within the broad category of backward classes and then provided with exclusive quota. This distinct feature of their reservation policy dates back to the colonial period. In the erstwhile princely state of Mysore, affirmative action began as early as in 1874 when a government decision reserved 80 % of the posts in the Police department for the non-Brahmins, Muslims and Indian Christians. In Kerala, the demand for reservation for under-represented communities was accepted as early in 1936 in the princely states of Travancore and Cochin, and in Malabar, even earlier, in 1921. Quotas were fixed not only for caste groups such as the Ezhavas, but also for religious minorities, the Muslims and sections of Christians. Post-Independence, on the re-organisation of State of Mysore as Karnataka, all non-Brahmin Hindu castes and all non-Hindu minority communities like Muslims and Christians were declared as backward classes. In 1960, on the recommendations of the Nagan Gowda Committee, the category backward classes was bifurcated into backwards (28%) and more backwards (22%). Together with the quota for SC/ST, the magnitude of reservation rose to 68 %. The Supreme Court in a landmark judgment, however, placed 50 % ceiling on the quantum of reservation. Muslims as a whole continued to be considered as among the backward communities. The Havanur Commission, 1972 recommended the creation of a distinct category of minority group with reservation not exceeding 6 %. The State classified Backward Classes into three categories: (a) Most backward; (b) More backward and (d) Backward. All Muslims whose income is less than Rs. 2 lakh per annum have been declared backward and placed exclusively in one of the sub-categories of ‘More Backwards’ with four per cent of the seats set aside for them. According to the information provided by the state government to this Committee, this measure has led to a substantive rise in Muslim share in the state government services. The number of seats Muslims get in professional courses like Medicine, Dental and Engineering has also increased to a considerable extent. Between 1996 to 2002, 346 Muslim students were able to secure seats in Medicine, 258 in Dental and 3486 in Engineering courses. Muslim share was fixed at 10 % that later rose to 12 %. At present, the reservation system in Kerala is as follows: Backward Classes 40 % (Ezhavas 14 %; Muslims 12 %; Latin Catholics 4 %; Nadars 2 %; Christian converts from S.C.s 1 %; Dheevaras 1 %; Other Backward Classes 3 %; Viswakarmas 3 %) and S.C.s and S.T.s 10 %. Tamil Nadu offers a model of affirmative action for Muslims or Muslim OBCs that is slightly different from that offered by Kerala and Karnataka. Unlike Kerala and Karnataka, Muslims as a distinct category are not eligible for reservation, yet most of the Muslim biradaris are included either in the backward or in the most backward list. The state government has done away with reservation on ground of religion, yet nearly 95 % the Muslims have been included within the fold of backward classes. To begin with, the Muslims who were educationally backward were given special treatment vide a resolution dated July 29, 1872. Later it was extended to the ‘aborigines’ and low caste Hindus. As the Brahmins were grossly over represented in high salaried jobs, a Government Order (1927) introduced compartmental reservation whereby the non-Brahmins were to have 42 % of the posts available and Muslims 17 %. Post Independence, reservation was extended to only the constitutionally recognized deprived categories, such as the SCs, the STs and the Backward Classes. Separate quota for Muslims was also withdrawn; rather various communities among Muslims considered backward were included in the list of Backward Classes. The Sattanathan Commission (1970) endorsed the 1951 categorisation, it identified 105 castes/communities as backward, and recommended 31 % reservation, whereas 18 % was left for the SCs and STs. Tamil speaking Muslim groups, such as Labbais, Deccani Muslims and others were included in the backward list. In 1980, 31 % quota for backward classes was raised to 50 % taking the total to 68 %. Following the recommendations of the Ambasankar Commission(1982) the backward classes were split into Backward Castes(BCs), Most Backward Classses(MBCs) and Denotified Communities. The quantum of reservation currently is 69 %; far beyond the Supreme Court limit of 50 %. The Tamil Nadu Backward Classes, Scheduled Castes and Scheduled Tribes (Reservation of Seats in Educational Institution and of appointments or posts in the Services under the State) Act, 1993 was included in the 9th Schedule through the 76th amendment of the Constitution. a. Reservation of seats for the entire Muslim community (excluding the creamy layer): Kerala and Karnataka. Reservations for OBCs has a longer history in the states than at the Centre. As the recommendations of the Mandal Commission came to be accepted, the Central list of OBCs, in the initial phase, was prepared by employing the principle of ‘commonality’. Thus, only those castes/communities listed both in the state list and also in the list prepared by the Mandal Commission were included in the Central list. It is not surprising therefore that a number of castes/communities that had either been listed only in the Mandal list or only in the state list were left out. This discrepancy was expected to be solved once a permanent body, namely, the National Backward Classes Commission (NCBC) was formed. The NCBC formed in 1993, has issued a set of guidelines based on social, economic and educational indicators, for castes/communities to be included in the Central list of OBCs. The discrepancy between the two lists, Central and State, is still evident. This is a general complaint and not confined to the Muslims alone. There are many OBC groups, irrespective of their religion, that are present in the State list but missing in the Central list. Madhya Pradesh, for instance, has 91 social groups listed as OBCs in the list recommended by the State Backward Classes Commission, but only 65 such groups have found entry in the Central list. Uttar Pradesh has 79 castes in the state OBC list, but only 74 in the Central list, in Rajasthan there are 74 castes in the state list but only 65 have been accorded OBC status in the Central list. Such discrepancy also applies in the case of Muslim OBCs. In Madhya Pradesh, for example, there are 37 communities listed in the state list as Islamic groups, however, only 27 of them are found in the Central list. In Bihar, after the recent revision of the list, there are 17 OBC groups that have not found place in the central list. Six of them are exclusively Muslim, namely, (i) Faqir/Diwan, (ii) Julaha/Ansari (the synonym Momin is in the Central List), (iii) Itrfarosh/Gadheri/Itpaj/Ibrahimi, (iv) Jat, (v) Gadaria and (vi) Surajpuri. In Uttar Pradesh, two Muslim groups-Mirshikar and Nanbai-have not found entry in the Central list. In Gujarat, Muslim groups such as Jilaya, Tariya-tai, Mansuri, Arab, Sumra, Tarak, Kalal and Bahvaiya are listed in the State’s backward list but not in the Central list. Similarly many Muslim groups in Maharashtra such as Mansooris, Pan Faroshs, Ataar, Sanpagarudi, Muslim Madari, Muslim Gawli, Darwesi, Hashmi, Nalband among others have not found entry in the Central list. The lists of OBCs prepared by the state governments have also missed many underprivileged castes and communities. There are a few groups among Muslims that have found place in the Central list but are yet to be included in the State lists. Kalwars in Bihar, Mansooris in Rajasthan, Atishbazs in Uttar Pradesh, Rayeens, Kalwars, Rangwas and Churihars in West Bengal are examples of such Muslim groups. There are still a number of Muslim groups that have neither been included in the State list nor in the Central list. These groups can be identified using the information collected by Anthropological Survey of India under its People of India Project. In Gujarat for instance, the Project found 85 Muslim communities, of which at least 76 are non-ashraf. In the Central list, however, only 22 of them have found entry, whereas in the State list, there are only 27 Muslim groups. In Bihar, according to the Project, there are 37 castes/communities that can be counted as non-ashraf, however, only 23 are in the Central list. In Uttar Pradesh, the Project lists 67 communities among Muslims, 61 of whom are occupational groups. Both the State and the Central lists of OBCs contain only 32 of them. While the Ashrafs and the Ajlafs occupy the highest and the middle positions in the Muslim social structure, the Arzals are the lowest comprising of those having similar traditional occupation as their Hindu counterparts in the list of Schedule Castes. It is widely believed that these communities are converts from the ‘untouchables’ among Hindus. Change in religion did not bring any change in their social or economic status. Because of the stigma attached to their traditional occupation, they suffer social exclusion. Despite this, they have been deprived of SC status available to their Hindu counterparts. Their exclusion from the SC list dates back to 1936 when the Imperial (Scheduled Caste) Order rejected SC status to Christians and Buddhists of similar origins. Depressed classes among the Muslims such as Halalkhors were included in the list but were barred from availing the benefits. This colonial decree remained the basis on which the government of Independent India, through the Constitutional (Scheduled Caste) Order, 1950, has denied them the status in accordance with the deprivations that they face. The Order, however, has been amended twice; once in 1956 to include the SCs among the Sikhs and later in 1990 to include the neo-Buddhists. Thus, practically only the Muslims and Christians of such origins continue to be denied the status. As a result, such Muslim groups namely, gadheris, gorkuns, mehtars or halalkhors, Muslim dhobis, bakhos, nats, pamarias, lalbegis and others remain impoverished and marginalized. Their inclusion in the OBC list has failed to make any impact as they are clubbed with the more advanced middle castes. Many have argued that the Order of 1950 is inconsistent with Article 14, 15, 16 and 25 of the Constitution that guarantee equality of opportunity, freedom of conscience and protect the citizens from discrimination by the State on grounds of religion, caste or creed. In this section, attempt has been made to quantify the relative deprivations that Muslims in general and Muslim-OBCs in particular face. Different variables have been employed, for instance, male and female work participation, representation in various levels and sectors of public employment, salaries and wages, per capita income, incidence of poverty, urban and rural land holding, relative share in education etc to ascertain the status of Muslim OBCs vis-à-vis their Hindu counterparts and also the non-OBC Muslims or Muslim-General. Most of these variables indicate that Muslim-OBCs are significantly deprived in comparison to Hindu-OBCs. For determining population distribution, the decennial census operation in India is the most credible source. In our task of determining the share of Muslim-OBCs, however, the Census exercise is inadequate, as since Independence, enumeration across castes or biraderies has been shelved. Such a decision has only led to speculations, claims and counter claims that lack precision. In some of the states however, the state backward classes commissions have made attempts to figure out the population of various castes listed as OBC in their respective states. But one must remember, most of such surveys date back to more than a decade or two. Further, since all the state governments or state level backward classes commissions have not undertaken such a survey, no all-India estimate can be made from them. Relying on the data provided by the 1931 Census, The Mandal Commission estimated the OBC population of the country to be 52 % of the total population of the country. It assumed the share of OBCs among non-Hindu (Muslims, Christians and Sikhs) religious groups also to be in the same proportion. Thus the share of non-Hindu OBCs in the total population of the country was projected at 8.40 %. Given the fact that the 1931 base is itself contentious, this estimate needs to be further examined. The Mandal estimate is also unreliable because a large number of castes/communities that were included in the Mandal list have not yet found place in the Central list of OBCs. More recently, the National Sample Survey Organization (NSSO), from its 55th round onwards, has begun providing selfreporting data across the broad category of OBCs among various religious groups. Thus, the share of Muslim OBCs in population, employment or education can now be gathered from it. The count of individual castes and their share, however, is still not available. In our analysis of population share of Muslim OBCs we will largely depend on the National Sample Survey, 61st Round. The survey data on OBCs falls short of the estimate made by the Mandal Commission; also, there is considerable variation in the figures provided by the two surveys, 55th and 61st round. Table 10.2 indicates that those reporting as OBCs among Muslims constitute 40.7 % of the Muslim population, as per the 61st round. Compared to the 55th round when Muslim OBCs were reported to be only 31.7%, the growth is of 9 %. The pattern remains the same in both rural and urban areas. As the NSSO provides self-reporting data, this only reflects either an enhanced awareness of their OBC status among the Muslim OBCs or substantive revision of the OBC list since the last round of survey. The growth in the population share of Hindu OBCs is also noticeable. The population share of SC/ST in the total Hindu population remains consistent in both the surveys. The category SC/ST and the benefits associated with it has a longer history, more than 50 years, and therefore the social groups included, to a large extent, are aware of their status. Table 10.3 provides the state wise distribution of Hindu and Muslim OBC population in the country. In the states of Kerala, Tamil Nadu and Haryana, Muslim OBCs constitute almost their entire Muslim population. In Kerala, this is mainly because of the fact that Mapillas who constitute more than 90 % of the Muslim population of the State have been included in the Central list. Similarly, Meo Muslims, an OBC group, forms the bulk of the Muslim population in Haryana. The Hindi-Urdu belt comprising Bihar, Uttar Pradesh, Rajasthan, Madhya Pradesh and Jharkhand also has the majority of the Muslims listed as OBCs. On the other hand, in the two states of West Bengal and Assam, both with substantial population of Muslims, the proportion of OBCs is miniscule. Thus, the benefits attached to OBC status is denied to most Muslims residing in these states. Regional analysis reveals significant inter-state differences. In 14, out of the 20 states for which data are presented, the share of Muslim OBCs has risen in the 61st round as compared to the previous round of survey. The increase is the highest in Rajasthan (32 percentage points), followed by Bihar (23 percentage points) and Uttar Pradesh (18 percentage points). A fall in their share is observed in West Bengal, Assam, Jammu and Kashmir, Karnataka, Delhi and Himachal Pradesh. While the change is extremely high in Delhi (24 percentage points), it is marginal in West Bengal. The latest round of NSSO’s survey (61st Round) estimates the OBC population share in the total population at 40.4 %. Of these, 34 % is the share of Hindu-OBCs and the remaining 6.4 of M-OBCs. In the total OBC population of the country, Muslim-OBCs have a share of 15.7 %. This, as we will see below, is not reflected in their representation either in public employment or in educational institutions. Unlike the category Scheduled Caste, the category Scheduled Tribe irrespective of the religious affiliation of the members of the tribe is entitled for reservation. The criterion followed for specification of a community, as scheduled tribes are indications of primitive traits, distinctive culture, geographical isolation, shyness of contact with the community at large, and backwardness. The criteria is not spelt out in the Constitution but has become well established. The Muslim component of ST population is very small. According to 1991 Census, it accounts for only 0.25 % of the total ST population of the country. The highest proportion of Muslims declared as STs is found in Lakshadweep where Muslims constitute the entire ST population (99.74 %). Muslim share in the ST population of Himachal Pradesh (7 %) is also quite significant. Elsewhere, Muslim STs are miniscule in numbers. The Muslim ST population is only 1,70,428 whereas the total population of the STs stands at 6,77,58,285 (1991 Census). (See Appendix Table 10.1) It must be noted that while STs get all entitlements irrespective of their religious backgrounds, all Muslims of tribal background do not get this benefit. There are many cases of claims of ST status by Muslim groups that have remained unattended. The most common indicator of educational attainment is literacy. In the absence of any other source providing data on the literacy levels of OBCs, in particular Muslim-OBCs, the Committee has used NSSO data to compute literacy levels. Literacy levels among the population aged 6-years and above shows marginal differences at the all-India level (Table 10.4). However, disaggregated analysis by place of residence reveal sharp differences across SRCs in urban areas; Muslims, and in particular Muslim-OBCs, are lagging behind Hindu-OBCs. The literacy levels among the Muslim-OBCs is the least in rural areas as well but the difference is not as sharp between them and other SRCs in urban areas. Almost half of the children aged 6-12 years are not currently attending school. It can be seen that the proportion of Muslim OBC children not attending schools aged 12 years or less is much higher than that of this figure (Fig. 10.2). While the difference between Muslim-OBCs and Muslim-Gen is not marked (both are about 55%), the difference in non-attendance level between Hindu-OBCs and Muslim-OBCs (49%, compared to 56%) is significant. Table 10.5 presents the proportion of persons in each SRC classified according to the highest level of education attained. A comparison across SRCs suggests that the educational levels of Muslim-OBCs and Muslim-Gen are lower than those of Hindu-OBCs. In general, educational levels among Muslim-OBCs are lower than the other two SRCs; the illiteracy is the highest among this group and a lower proportion of persons in this group complete school education or undertake graduate studies. Finally, the status of the three SRCs is examined with respect to their attainments in the field of higher education. Three levels of education have been used for this purpose - general graduates and above, technical graduates and technical diploma and certificate courses. It can be seen that all the three SRCs have a lower proportion of persons holding a technical/non-technical degree or technical diploma/certificate compared to the Hindu-OBCs. Except in the case of technical diploma/certificate courses, Muslim-OBC has the lowest level of achievements in higher education; in general, Hindu-OBCs do better than the other two SRCs. Thus, in terms of higher education also, the Muslim-OBCs lag behind the other SRCs namely Hindu-OBCs and Muslim-Gen. The achievement levels in education of a community get reflected in its employment status. The relatively low levels of attainment in education by the Muslim community, in comparison with national averages, and even Hindu- OBCs, can be expected to result in correspondingly low status in the labour market. The employment status of workers of the three SRCs is analyzed using different indicators, qualitative and quantitative, based primarily on NSSO 61st Round data. In addition, the Committee has also used data from the earlier 55th Round survey (1999-2000) on earnings. Finally, data specially furnished to the Committee by ministries of the Central Government, Central Public Sector Undertakings (PSU), Central Security agencies, State Public Service Commissions, and Academic Institutions provides valuable information on the representation of these SRCs in what can be referred to as an elite sector. The work participation rate  (WPR) among the 15-64 year population shows the presence of a sharp difference between Hindu-OBCs (67%) and the two Muslim SRCs (about 55%), with WPR among both categories of Muslims being substantially lower at the all India level (Fig. 10.3, see also Appendix Table 10.2). The difference between Muslim-Gen and Muslim- OBCs, however, is marginal (56% and 54% at the all India level). This difference can be observed in both rural and urban areas and among females. Within the male population, however, differences in the WPR are marginal. According to the NSSO 61st Round data, while 9.2% of Muslim-OBCs of all age groups were unemployed in 2004-05, the unemployment rates were lower at 7.5 and 7.7 per cent respectively for Hindu-OBCs and Muslim-Gen. Similar differences were observed for both men and women and in rural and urban areas  suggesting that in general, unemployment rates were the highest among Muslim OBCs as compared to the other two SRCs under consideration here. The sector in which the workers are engaged is an important indicator of the socio-economic status of the community. Fig. 10.4 clearly indicates that the proportion of Muslim-Gen and Muslim-OBC workers engaged in the formal sector is below the corresponding proportion for According to the NSSO 61st Round data, within the formal sector, the share of Muslim-OBCs in government/ PSU jobs was much lower than those of Hindu-OBCs and Muslim-Gen. While 7.2% of Hindu-OBC workers in rural areas were employed in such jobs, the shares of such workers among Muslim-Gen and Muslim-OBCs were 5.8 and 3.4 per cent respectively. The differences in urban areas were sharper with Hindu-OBCs (11.3%) much ahead of Muslim-Gen (7%) and Muslim-OBCs (3.5%). The inferior employment situation of the Muslim-OBCs vis-à-vis the other two SRCs is also reflected in the fact that a much smaller proportion of workers among them are engaged in regular wage/salaried jobs, especially in urban areas.The proportion of workers engaged in regular employment in rural areas ranged between 6-7 % for all the three SRCs. However,in urban areas, the participation of Muslim OBCs (20.4%) in regular jobs was much lower than that of Muslim-Gen (31.2%) and Hindu-OBCs (36.4%). In general, therefore, Muslim-OBCs are lagging behind Muslim-Gen and Hindu- OBC categories in terms of participation in the formal sector and jobs that provide regularity of employment (both waged and salaried). Workers can be divided into two broad categories-casual and regular. Regular workers can be further subdivided into those who work in public or private sectors. Table 10.7 shows that there is no significant difference in wages paid to SRCs. Interestingly, wages received by Muslim-OBCs are higher than that received by Muslim-Gen and Hindu-OBCs. This can be observed for both male and female workers. Salaries paid to Hindu-OBC and Muslim employees in both the public and private sectors are lower than the average salaries. Muslim-Gen employees are marginally better off than Hindu-OBC employees. Muslim-OBC employees receive salaries that are significantly lower than the other two SRCs. This is true for both the public as well as the private sector thus indicating that more Muslim OBCs tend to be in low salaried jobs as compared to other SRCs. 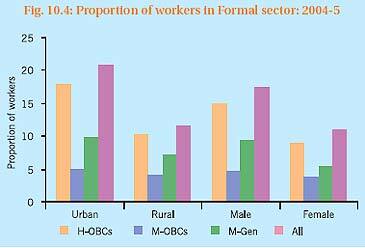 Among male regular workers, Muslim-OBCs are relatively more deprived than other two SRCs; differences between Muslim-Gen and Hindu-OBCs, however, are marginal. In the case of women workers, Muslim-OBC workers are less deprived in the public sector vis-à-vis the other two SRCs; in the private sector, on the other hand, they are deprived to a greater extent. The distribution of male workers by place of work is not very different across SRCs. A large proportion belonging to all these SRCs either work in employer’s enterprises or one’s own enterprise/dwelling. A few differentials across SRCs can be noticed. For example, a relatively larger proportion of Muslim-OBC workers work in employer’s enterprise while lower in construction sites (See Table 10.8). Table 10.10 summarizes the situation in three central government organizations, employing a total of over 26 lakh workers (see also Appendix Table 10.3 for details). Relative deprivation of Muslim-OBCs is highest in the Railways (employing more than 14 lakh workers) and in Central PSUs (for which the Committee has received data pertaining to almost 7 lakh workers). Representation is also low among candidates recommended for selection by State Public Service Commissions (SPSC). Muslim-Gen are also significantly under-represented in all sectors, and particularly in Central Security Agencies, Central PSUs, candidates recommended by SPSC and Universities (both teaching and non-teaching posts). While Hindu-OBCs are also under-represented, deprivation is less than that of Muslim-OBCs in five out of the six agencies, and less than that of Muslim-Gen in three out of the six agencies. A cursory look at Table 10.10 and Appendix Table 10.3 makes it clear that all the three SRCs, Hindu-OBCs, Muslim-OBCs and Muslim-Gen, are under-represented when their share in employment is compared with that in population. Hindu OBCs constitute 34% of the population but in none of the Central Organisations is their share more than 12%. This includes even the lowest level, i.e, group D employees. Muslim OBCs whose share in the population is 6.4 %, have less than one percent presence in these organizations, with the exception of central security forces (3.6%). In the higher echelons of these services, they are nearly absent. In the central security forces (including BSF, CRPF, CISF and others), Muslim OBCs are better represented than Muslim-Gen (3.6%, compared to 1% Muslim-Gen). They however still fall short of their share in population. It is noteworthy that in the case of Muslims, even the non-OBC section of their population is significantly underrepresented (varying from 3% to 4.5%). In the states the situation is better for the Hindu OBCs (Table 10.10 and Appendix Table 10.3). Although still short of proportionate representation, their share in the upper and middle levels is much higher than that in the central organizations. However, a large proportion of the Hindu OBCs find employment at the Group D level. While Muslim- Gen has a comparatively better representation in Group A and D posts of state services, their representation in middle levels posts is marginal. Muslim OBCs have better share at the Group A level, but their presence is insignificant at all other levels. Out of almost 1.5 lakh persons working in Universities, the representation of Hindu OBCs among faculty members is more or less the same as their share in population (Fig. 10.5). Muslims, both OBC and non-OBCs, seem to have only a token presence in the universities. This analysis indicates that while Hindu-OBCs have been able to reap the benefits of reservation of posts in universities, the representation of both Muslim-OBCs and Muslim-Gen in different sectors remains grossly inadequate. The educational and employment status of a community together contribute to the economic status of a community. In this sub-section, the economic status of the SRCs is analyzed using different economic indicators. The most important of such indicators, particularly in developing economies with large rural bases, is land holdings and expenditure (as a proxy for income) levels. Based on the latter, it is possible to estimate the incidence of poverty and the extent of inequality between the three socio-religious categories (SRCs). The incidence of poverty is measured by the proportion of poor persons (referred to as Head Count Ratio). In Fig. 10.6, all India estimates show that the incidence of poverty is highest among Muslim-OBCs (38), followed by Muslim-General (35). In contrast the proportion of poor among Hindu-OBCs (27) is lower than even the national average (28). The higher incidence of poverty among Muslim-OBCs and Muslim-Gen, compared to the national average and Hindu-OBCs, can be observed in both urban and rural areas. The difference between Muslim OBCs and Hindu-OBCs is particularly striking in urban areas. The proportion of poor Muslim-Gen persons is almost 9 percentage points higher than among Hindu-OBCs. The Muslim-OBCs were even worse off with the share of poor persons being 14 percentage points higher than that of Hindu-OBCs. The MPCE of the three SRCs is much lower than the national average (Fig. 10.11). Among the three SRCs, the MPCE of Muslim-OBCs is the least. The condition of Muslim-Gen is marginally better off than the other two SRCs as reflected in their MPCE. 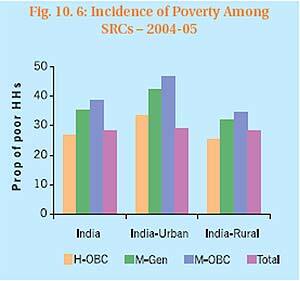 In urban areas, also, the MPCE of the three SRCs is lower than the national average. As was the case with poverty levels, however, the difference between SRCs is striking in urban areas. The MPCE of both Muslim groups is much lower than the national average. Moreover, the MPCE of Muslim-OBCs is much lower as compared with Muslim-Gen in urban areas. In rural areas, differences between MPCE of SRCs are narrower. The MPCE of Muslim-OBCs is about the same as the national average, while MPCE of Muslim-Gen is marginally lower than that of Hindu-OBCs. At the all-India level, there are marginal differences in inequality levels between the three SRCs being analysed (Table 10.12). 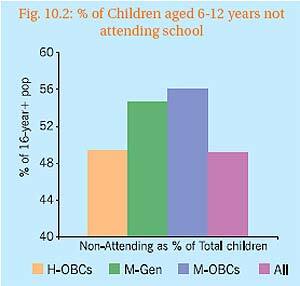 Overall, the inequality levels are somewhat higher among Muslim-OBCs as compared to other SRCs. Given the discussion above, higher levels of poverty is combined with relatively higher levels of inequality. Asset holding of different SRCs is an important index of development. While there is no all-India level data source on asset holdings, NSSO does provide information on land owned. Land holdings constitute an important form of asset holding for the population in developing countries, particularly in rural areas (Figure 10.7). 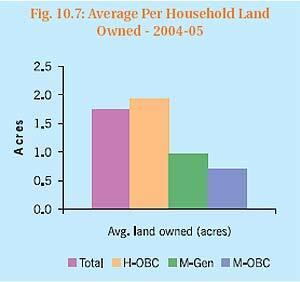 Average land holdings of Hindu-OBCs are clearly much better (about twice) than that of Muslim-OBCs and Muslim-Gen. In fact the average land holdings of Hindu-OBCs (1.9 acres) are higher than even that of the national average (1.7 acres). The differences in average land holdings of Muslim-Gen and Muslim-OBCs are almost the same (1.0 and 0.7 acres, respectively). As per the latest round of NSSO survey, Muslim OBCs constitute 40.7 % of the total Muslim population. 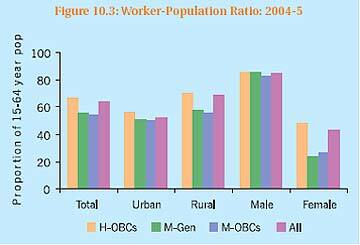 They are also a sizable component (15.7%) of the total OBC population of the country. The NSSO survey however fails to provide disaggregated figures across individual castes/ groups included in the OBC lists of the Centre and the various states. As a result, intra- OBC differentials along castes/groups in terms of crucial indicators such as educational attainment and employment share cannot be estimated. The Committee therefore is of the opinion that enumeration of castes/groups as part of the decennial Census exercise is critical to assess the equitable distribution of benefits meant for groups included in the category, OBC. The main findings about the economic and educational status of the three SRCs are summarized in Table 10.13. It is important to underline that Muslims in India are not a monolith, and this is what our analyses across various indicators of human development also suggests. While Hindu-OBCs continue to be relatively deprived in terms of the all-India data, the Muslim community as a whole is lagging behind Hindu-OBCs. However, overall, the conditions of Muslim-OBCs are worse than those of Muslim-Gen. The abysmally low representation of Muslim OBCs suggests that the benefits of entitlements meant for the backward classes are yet to reach them. To explore the differentials across the SRCs further, an exploratory exercise was undertaken to assess if the proportions of Muslim-OBC, Muslim-Gen and Hindu- OBC differ significantly in high and low income groups (See Appendix Table 10.4). It is noteworthy that, as compared to other SRCs (except SC/ST), the share of Muslim-OBCs and Muslim-Gen population is significantly higher in low income groups. Within the Muslim community, a larger percentage of Muslim-OBCs fall in the low income category as compared to Muslim-Gen. In contrast, much smaller share of Muslim persons belong to the high income category. Interestingly, a larger share of SCs/STs belong to the high income group as compared to Muslims. Within Muslims, Muslim-OBCs are slightly lagging behind the Muslim-Gen in the high income group. Based on the arguments and data presented here, it is logical to suggest that Muslims in India, in terms of their social structure, consist of three groups-ashrafs, ajlafs and arzals. The three groups require different types of affirmative action. The second group, ajlafs/OBCs, need additional attention which could be similar to that of Hindu-OBCs. The third group, those with similar traditional occupation as that of the SCs, may be designated as Most Backward Classes (MBCs) as they need multifarious measures, including reservation, as they are ‘cumulatively oppressed’. 3. All India Reporter 1960, Mys. 338. 9. Census of India, 1901, p. 543. 14. Later amendments were made for Mazhabi Sikhs (1956) and Neo-Buddhists (1990). 17. Balaji vs the State of Mysore, All India Reporter, pp. 649-64. 18. Under Section 9(1) of the National Commission for Backward Classes Act, 1993 the Commission shall examine requests for inclusion of any class of citizens as a backward class in the Central List of Backward Classes and hear complaints of over-inclusion or under-inclusion of any backward class in the lists and tender such advice to the Central Government as it deems appropriate. 19. This is not to deny the complex two way linkages between employment and education. For instance, secure employment provides parents with the resources to invest in education of their children, as well as creating economic incentives to education. 20. This is the proportion of persons aged 15-64 years who are engaged in nay economic activity (working), either as principal or subsidiary activity. 22. Inequality levels are measured using the Gini Coefficient. The lower the value of this coefficient, the less is the extent of inequality.